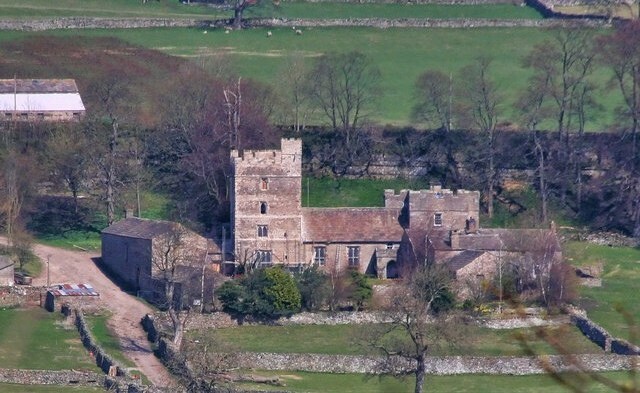 Notes: Nappa Hall is a fortified manor house in Wensleydale, North Yorkshire, England, described by English Heritage as "probably the finest and least-spoilt fortified manor house in the north of England". It stands 1 mile east of Askrigg, overlooking pastures leading down to the River Ure. A single-storey central hall sits between two towers, a four-storey western tower and a two storey eastern tower. The four-storey tower has a turret, lit by slit vents, for a spiral staircase that climbs to crenellated parapets. The taller tower retains its original windows, but sash windows were inserted in the 18th century in the lower two-storey block which housed the kitchen and service rooms, at the opposite end of the hall. In the 17th century, an extra wing was added. Nappa Hall is a Grade I listed building.